Once again, the Apo View Hotel, Davao's premier hotel is gearing up another colorful event as the City of Davao celebrates the annual Kadayawan Sa Dabaw 2012. 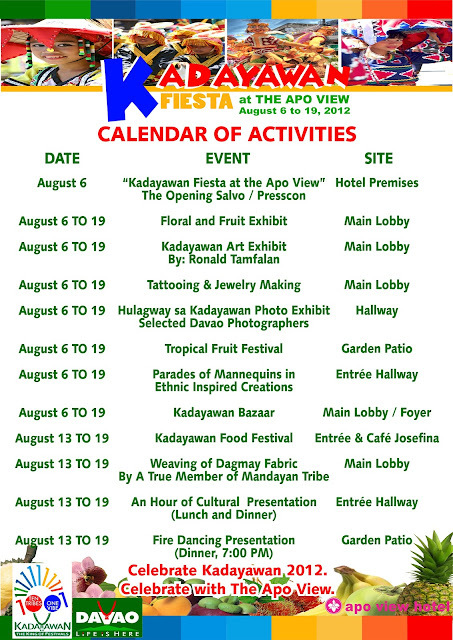 Now on its 5th year, the Apo View Hotel proudly presents KADAYAWAN FIESTA AT THE APO VIEW 2012 showcasing Mindanao’s artistic, cultural and historical heritage starting August 6 to 19, 2012. During the two-week celebration, Apo View Hotel stored spectacular events that will truly showcase the authentic artistry and richness of culture not just the City of Davao but our Island Mindanao as well. KADAYAWAN FIESTA AT THE APO VIEW 2012 is an amazing celebration of the bounties of nature and the richness of culture that guarantees exciting events and festivities right at the very heart of the Apo View Hotel.